Since the merger that has created Penguin Random House, there has been precious little speculation (except by me, as far as I can tell) about what this new behemoth in trade book publishing could do to exploit their scale in new and innovative ways. Their scale advantage is huge. PRH has something in the neighborhood of half the commercial trade books published, bestsellers and below. (You see numbers as low as 25% for this and most of the time estimates put it around 40%.) For several decades, the big US book clubs — Book-of-the-Month Club and the Literary Guild — demonstrated that having about half the books was “enough” for very large numbers of people to feel comfortable that their choices of what to read from within that group of titles would be sufficient for most of their needs. One PRH executive kindly explained to me the company’s inherent resistance to the subscription model, which would seem to appeal most to the heaviest readers looking for a bargain. As the largest player in the market, PRH isn’t looking to reduce the spending by the people who are the biggest sources of industry revenue, which a successful subscription offer would inevitably do. 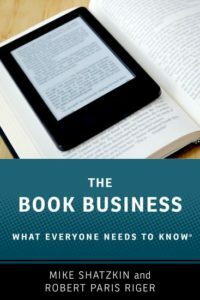 (That subscription model, or “Netflix for ebooks”, is complex in ways that are often ignored, but which Joe Esposito spells out very clearly.) Of course, that doesn’t mean the company wouldn’t consider it in an environment where subscription services were taking a big part of the audience (certainly not the case yet, but watch what happens if Scribd or Oyster or Entitle or the new Rooster succeed). It does seem to say that they won’t be pioneers in this field. And there is no sign yet that they’re taking up my idea to use VMI to create their own bookstores, either. But PRH UK — echoing what was said to me by RH US CEO Markus Dohle some years ago — has now announced it is becoming a consumer-focused publisher. Hannah Telfer, who was made “group director, consumer and digital development” in January, says discoverability depends on “building a direct relationship with consumers”. And she claims “our scale” is a key enabler of doing this “properly”. This is refreshing, since most of the industry thinking about how they would use scale seems to be more about consolidating warehouses than getting smarter about talking to consumers. One article in The Bookseller details staff changes and initiatives around this goal. (And another expresses some skepticism about whether their plans are adequate to the task. That second piece suggests they need to think about selling direct, a recommendation I have expressed some reservations about.) On the one hand, the first article suggests some really broad, company-wide objectives, including “the potential for Penguin Random House to be a cultural and entertainment powerhouse; a home for all audiences”. At their recent sales conference. CEO Tom Weldon described the opportunity for PRH “to create the blueprint for a publisher brand as a consumer brand and, in doing so, capture the attention of the world for the stories, ideas and writing that matters”. That sounds like one big brand. At the same time, there was clear acknowledgment of the importance of what we call “verticality”, or “audience-centricity”. An “audience segmentation project” was announced. So was cross-imprint attention to specific subjects, with “cookery” and “crime” cited. One tool that it is clear Penguin Random House has and will use is called Bookmarks, described as “the Random House readers’ panel”. New plans call for it to “become a PRH resource, giving all parts of the business access to over 3,500 readers through surveys and focus groups”. Of course, the more different ways the company wants to use that panel, the more difficult it will be to get meaningful data from it. In fact, it would seem that what is really called for is an ongoing “panelization” process, by which new people are being added all the time to a number of panels that can answer questions about different communities of interest. One panel can’t serve all purposes. This brings two topics into bold relief that have not historically been part of a book publisher’s thinking or skill sets. 1. It calls for new and nuanced thinking about brands. 2. It calls for a multi-faceted plan for engagement with individual consumers. Advice directing publishers to think about branding for consumers is plentiful these days. Since I first started thinking and writing about publishing and brands, something disruptive occurred which I wasn’t thinking about at the time: self-publishing. My original notion was that the challenge was establishing brands with clear vertical, audience-centric identities. Probably the best example of doing that successfully in the big US houses has been Macmillan’s establishing of Tor as a brand for science fiction and tor.com as a destination site for science fiction devotees. It is well over two years since I wrote about tor.com having hundreds of thousands of email addresses that they could address with promotions that got very high open rates. Tor.com gives Macmillan’s science fiction list a clear label of not-self-publishing. But outside Tor, for their general list, Macmillan uses many imprint names. A novel might be published as St. Martin’s, Holt, Farrar Straus, or Thomas Dunne Books (among others), each of which probably has “meaning” to buyers at major accounts, big libraries, and major book reviewers, but which means precious little to the general public. Does the average person know those names better than they know, let’s say, Thomas & Mercer (the new imprint of Amazon) or Mike & Martha Books (a name I just made up)? But ultimately, it is important for Macmillan, and for every publisher, to stamp “major publisher” on their books to let the public know “this is from a long-standing and established book publisher” on the assumption, which I would share, that people who don’t know the names would still trust an institution rather than a self-interested individual to “pick” their books. So here’s the rule about branding. Each major house should pick one name that is an umbrella. It goes on every book to establish the company as a major source of quality literature, enjoyable reading, and book-packaged information.Trying to target more precisely than that should be the job of the “imprint” brand under the umbrella brand. And that brand should be vertical, identifying subject or audience. That’s Tor in the Macmillan example above. Note that right now Macmillan is not a brand being used by any of the US companies in the Macmillan family. But email lists, as the PRH UK statements suggest, are just one aspect of consumer engagement. And the statements from PRH also implicitly claim that a much bigger company has advantages in pursuing it. Aside from their ability to analyze existing email addresses among their signups or that they find through other means (hitting their web sites, self-identified in social media) to understand and reach audiences better, large companies can create special interest verticals to pull traffic (driving email signups) and give themselves a range of promotional opportunities. We see Simon & Schuster doing a lot of that kind of work. I’ve become a daily fan of “250 Words”, an email from their new business book web vertical that summarizes the core proposition of a business book every day. Whether that, or other vertical efforts of this type the house is trying, can turn into a remunerative web community or even a good place to get a book launched, is still an open question. But it is the kind of experiment that could produce a launching pad that could really help S&S with business books. We are in the earliest days of big publishers changing from near-total dependence on intermediaries to reach their markets to having direct relationships with consumers. For now, most houses are pretty quiet about what they’re doing, partly because they think they’re inventing something and partly because they don’t know how well any of this will work. But relative silence shouldn’t be interpreted as relative inaction or inattention. It isn’t news to the big publishers that they need to talk to audiences directly. Penguin Random House has advantages of size relative to the others in the Big Five, but the rest of them have advantages of size relative to everybody else. Note to readers: because of glitches and fiddling not worth detailing, the last two posts didn’t go out through our normal email distribution (which makes some people refer to this blog as my “newsletter”!) If you didn’t receive posts entitled “Getting Mark Coker Right This Time…” and “Sometimes One More Calculation…” they are linked here for your convenience.